Former Libyan Ambassador to the UAE Aref Nayed says that the UN’s efforts to bring about stability and security in Libya have failed because it has allowed the Libyan Political Agreement (LPA) to be implemented selectively, not in full. 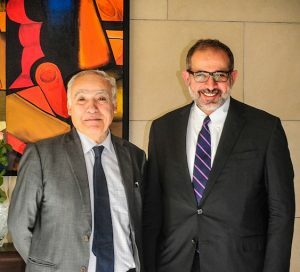 In a letter to the UN special envoy Ghassan Salamé following their meeting in Tunis on Monday, Nayed, who heads the Libyan Institute for Advanced Studies, said some LPA articles had been implemented but others had been ignored, deadlines had passed unobserved and, while certain political and social groups had been involved in the attempted political settlement, others had been excluded. This had “contributed enormously” to what Nayed said was the failure of UNSMIL’s efforts to bring about stability and security in Libya. Despite the LPA’s statement in its governing principles about the rights of Libyan citizens, protecting their lives and ensuring their daily needs, the wealth of the Libyan people had been plundered and many people had been kidnapped, tortured, incarcerated or killed “every single day since the year 2011”. Likewise, there had been “violations, displacement, and persecution continue against cities, tribes, and entire groups”. More than half the entire Libyan population were affected in one way or another by this. Despite Clause 10 of the LPA Governing Principles stating that the House of Representatives is the only legislative authority during the transitional period, the Presidency Council had “repeatedly” violated this by making treaties with other countries, asking military aid from them, using Libyan funds at home and abroad and appointing representatives abroad “without any reference to the Libyan House of Representatives”. Despite Clause No. 17 of the Governing Principles committing the GNA to combat terrorism, GNA defence minister Mahdi Al-Barghathi had supported the Benghazi Defence Brigades which had been involved with Al-Qaeda, ISIS and other terrorist groups. Article No. 20 of the Governing Principles (Commitment to the implementation of the decisions of the legislative authority concerning the disbandment and integration of armed formations) had been disregarded. Armed formations continued to be funded via the GNA or the Central Bank of Libya. Article No. 27 (A total commitment to addressing the humanitarian situation of the refugees and displaced persons as well as facilitating their voluntary return in dignity and safety to their areas as soon as possible) was still inactive. “It is strange,” Nayed also pointed out, that the United Nations had for many months allowed “without reservation or comment” the head of the PC to issue individual decisions, “although all those resolutions are null and void according to Article No. 7”. The article stipulates that “the GNA should adopt during its first meeting its own decision-making mechanisms with a two-thirds majority of its members”. The issuing of decrees by Serraj by himself has already been denounced by PC member Fathi Majbri along with boycotting members Ali Gatrani and Omar Al-Aswad. Nayed mentioned several other violations of the LPA which the UN had apparently condoned. Expressing the hope that as new UN special envoy, Salamé would ensure that the LPA be implemented in full, Nayed also reminded him that the tenure of the PC and its GNA would expire on 17 December 2017. At that point, the GNA would become a caretaker government until fresh elections were held. These, he noted, had been agreed at the Paris summit between Khalifa Hafter and Faiez Serraj and were widely supported in the country. Without them, he indicated, there would be no legitimate government in Libya.